The third Friday in September is the global Park(ing) Day, where parking spaces throughout the whole world are being transformed into livable green oasis. We are going to join the movement in cooperation with young students from Blågårds skole, who are supposed to design the parking lot in front of our office. The project is a part of the choose subject “Citylab”, which arki_lab facilitates this school year for the 7th graders at the school. The last workshop we had at Blågårds School we asked the students to make moodboards, where they identified problems they see in public space and also come up with solutions. It resulted in some beautiful illustration and ideas, and from the exercise we found 5 different problems that the young people experienced in public space. The themes were too much traffic, trash and not enough green, community feeling and private space for young people. In this week the 7th graders visited our office to get to know the area and the scale of the parking lot. Also we wanted them to have an understanding of what we do and how we work in our everyday life. Our experience is that when students are invited into new learning spaces outside the classroom it opens up for new perspective. It often helps the process to have some creative equipment to start of the brainstorm, which in this case was some colourful chuck. They were divided into 5 teams that represented the different problems they identified in the last workshop. They were all fully engaged in brainstorming creative ideas and solutions. Some wanted to have a basket trashcan to help people clean up after themselves, while others proposed social benches to have more conversations in public space. ”I have not tried to paint with chuck, since I was a little child” one of the boys exclaimed while he covered the street in beautiful colours and shapes. 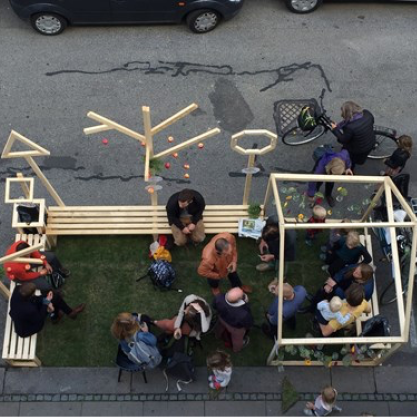 In the next workshops the students are going to specify and build their different ideas, so they are able to show them to the public at Park(ing) Day the 18 th of September. During the day we expects to invite various stakeholders with an interest in the young and urban development and allow students to express themselves and debate with them. In the afternoon we will continue with music, happenings and a festive atmosphere. We are very excited to be a part of the Park(ing) Day movement and are looking forward to show the work of the young kids. Anyone can participate and be a part of the transformation of the city, so hurry up and jump on the green wave! You can read more about theinitiative on Parkingday.org, and you can get more details about our event at arkilab.dk or Facebook. Info will be coming up continuously – We hope to see you!